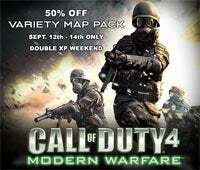 As we mentioned last week, this weekend is a special double XP weekend for Call of Duty 4: Modern Warfare players, though now it's now an Xbox 360 only weekend, with PS3 fans most likely getting the treatment a week later. Also exclusive to Xbox Live is a special half price sale on the Game of the Year Variety map pack. The pack will be slashed from 800 Microsoft points to 400 from 12:01am Pacific on the 12th to midnight on the 14th, which coincides with the double XP event. Honestly I can't see how anyone still playing Call of Duty 4 doesn't already have this pack, but it's a nice gesture. This weekend will also see members of Infinity Ward entering the fray between noon and 4pm on Saturday to play with their fans, so be sure to hit the jump, write down their gamertags, and start coming up with countless annoying questions to bombard them with as they struggle with the frustration of having to work on a Saturday.CALL OF DUTY® 4: MODERN WARFARE™ GAME OF THE YEAR VARIETY MAP PACK AVAILABLE THIS WEEKEND FOR HALF PRICE Xbox LIVE to Host Exclusive Double XP Weekend from Sept. 12-14 Santa Monica, CA – September 11, 2008 – Gamers find your Kevlar, because this weekend the bullets will fly as Call of Duty® 4: Modern Warfare™ Variety Map Pack hits half-price on the Xbox LIVE® online entertainment network for a limited time. Starting Sept. 12 (12:01 am/PDT) and running through midnight on Sept. 14, Activision Inc.'s (Nasdaq: ATVI) blockbuster DLC by Infinity Ward will be available for 400 Microsoft Points. As part of the limited time offer, Xbox LIVE will also will host a Double XP Weekend, allowing players to earn twice as many Experience Points. Additionally, during the release, the limited edition Prestige gamer pics will also be made available, for free download on Xbox LIVE® Marketplace. Members of Infinity Ward will also be online between noon – 4:00 pm/PDT on Saturday, September 13 to play with fans. While online, players should be sure to add the following Infinity Ward gamertags to their friends list: Fourzerotwo COD4artistWill COD4qaEd COD4qaJustin COD4designerJon COD4designer1 COD4designer2 COD4studioVince COD4studioJason The Call of Duty 4: Modern Warfare Variety Map Pack includes an adrenaline-pumping four Modern Warfare maps. * "Broadcast" features tight corridors and wide open parking lots where large groups utilize strategic maneuvers through close-quarter fighting * "Chinatown" delivers the action by the full moon against a backdrop of brightly colored lamps, antique shops and neon signs of the local district * "Killhouse" is a desolate warehouse under enemy attack where squads must move from building to building to full take control of the combat * "Creek" is a large open village nestled in a heavily wooded area, where games will fight between high ridgelines and deep in underground caves More details on the Call of Duty 4: Modern Warfare Variety Map Pack, Double XP weekend and information regarding terms, conditions, and official rules are available on the official event page: www.infinityward.com.